Clean the fish pieces and marinate it with 1/2- 1 tbsp chilli powder, 1/4 tsp turmeric powder and salt. Soak tamarind in 1 cup water , extact its juice and keep it aside. Heat oil in a pan and fry the marinated fish pieces and keep them aside. Heat oil in another pan or manchatti/ earthern pot and splutter mustard seeds and fenugreek seeds. Add chopped onions and saute well. Then add green chillies, crushed ginger and garlic, tomato and curry leaves and saute well. Add 1 tbsp chilli powder, coriander powder and 1/4 tsp turmeric powder mixing with little water and saute for 2 minutes. Add tamarind extract and enough salt and allow to boil. colour and texture of the gravy proves its taste...so tempting, happy to follow you! 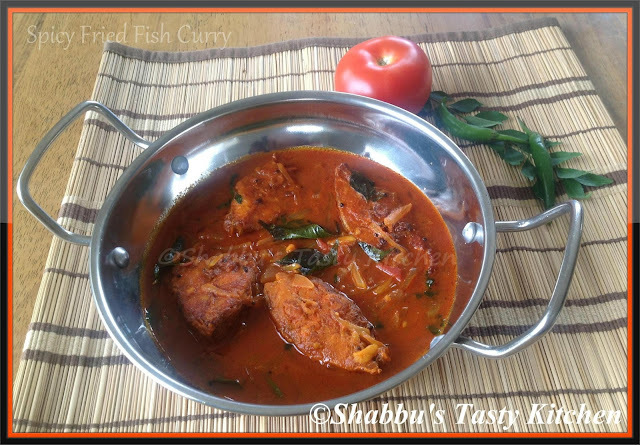 like the curries without coconut..
Mouthwatering here, super catchy and eye pleasing fish curry.